Did several rough design sketches for the new Designed Future online program, Des igned Prosperity, and sent it off to the CEO. I was not particularly happy with any of them, but she liked them and sent them to the board for comments. They ended up picking two that they would like to see further iterations of. Lesson learned: save yourself some effort by being willing to show ugly rough drafts. Now I know where to be best expending my energy in further revisions. Attended the Boston OpenIDEO rapid prototyping workshop. Ended up working with a partner on a project for a “smelly diaper alert” sensor. We developed quick sketches for an ad campaign, then put together a quick storyboard, and then had open choice for the third prototype iteration. In each iteration we had only about ten minutes to complete our work. It was interesting doing these prototypes back-to-back in such rapid succession. Changing the format of the prototype being presented each time help define new problems that needed to be solved.Working with a stranger under such tight time constraints proved to be particularly challenging. Despite agreeing on a lot of the direction for our initial prototype, we could not find a consistent vision for the ad, and ended up creating separate but complementary layouts. And for our final prototype, we ran out of time before even being able to agree on a type of project that was sharable with the other groups. As we presented, therefore, I improvised a role playing scenario that was largely a repeat of the information we had worked out in the storyboarding process. It was a good learning experience about conflict in collaborative environments, which is something I have not had nearly as much trouble with before in other group activities. Attended the Design Thinking meetup group which was working on new fundraising programs for the nonprofit Community Servings. Our group prompt was about encouraging people to live healthier lifestyles. We had some good wacky ideas such as a “fitness in the kitchen” classroom—which was eventually nixed due to safety/insurance/litigation fears!—and eventually settled on a purchasable community program of small group grocery store tours with one of the Community Servings nutritionists, who would then answer personal questions relating to the attendee’s food preferences and issues/allergies. Almost all of the other groups’ suggestions involved offering paid cooking classes. As a result, I was proud of our group being able to offer up something different and more experimental but still feasible and within the nonprofit’s theme and scope. For the Storytelling for Change class, I wrote a rough outline of a personal story from this past summer of interrupting a couple of boys fighting in the street, and then tying it back into my job search, and jobs that skills that I have that are not immediately apparent from my employment history. In group, I practiced reading it aloud, and was also able to get good feedback on how to revise it, and how to clarify my point about my skillset, and also about adding a more clear “call to action” about the reaction I want from the listener (hire me!) after hearing the story. From Hugo I received a list of good design websites to be following, and went through them to find designs that were particularly appealing to me. the Frog Design Thinking: Lead Change in Your Organization course. 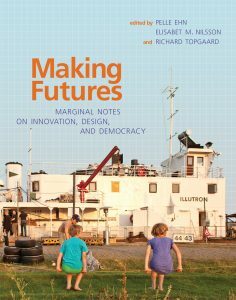 I finished reading Six Thinking Hats and continued my reading of Making Futures: Marginal Notes on Innovation, Design, and Democracy, which is just amazing.